One of the big questions at this point in the game is, can stocks really go higher from here? After all, the S&P 500 is up 10% from the pre-election low and the NASDAQ Composite has added 12.6% since November 4th. So, with stocks having run a long way in a short period of time, isn't a pullback the next order of business for Ms. Market? Our furry friends in the bear camp certainly think so as they have a growing laundry list of reasons why the market should start heading south. Stocks are overbought, we're told. Sentiment has become overly optimistic. The Fed will be pushing rates higher. Inflation is rising. The strengthening dollar puts pressure on earnings. Trump's protectionist policies will hurt the economy. A trade war could be waiting in the wings. Valuations are high. And all the goodies the Trump administration is promising are going to take time to deliver. So, while we wait for tax reform to put more cash in consumers' pockets and corporate America's coffers, reduced regulation to make it easier to do business, and a stimulus plan to build all kinds of good stuff, what is the market to do? So far at least, it looks like the answer is simple - grind higher in a slow, frustrating fashion. Of course, we must understand that one of the bouts of uncertainty the market experiences from time to time could easily give the bears an edge for a few days/weeks. IMO, the action seen between September and early November last year would be an example of what this might look like. And to be sure, the bears have the table "set" for things to go their way at some point. 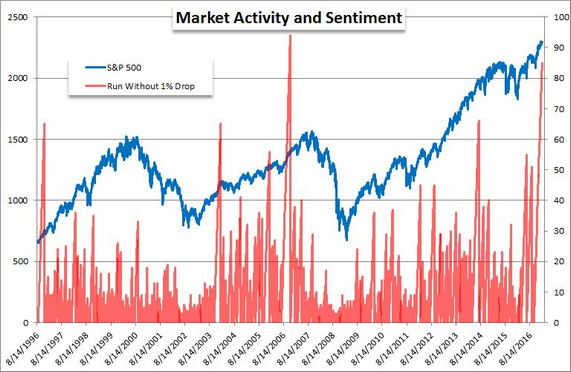 One example of this situation can be seen in the sentiment data. According to Investors Intelligence, the number of investors claiming to be bullish is now above the highs seen in October of 2007. Uh oh. If one studies this chart in detail, you will note that when the percentage of Bulls exceeds 60%, stocks tend to stumble - sometimes hard. 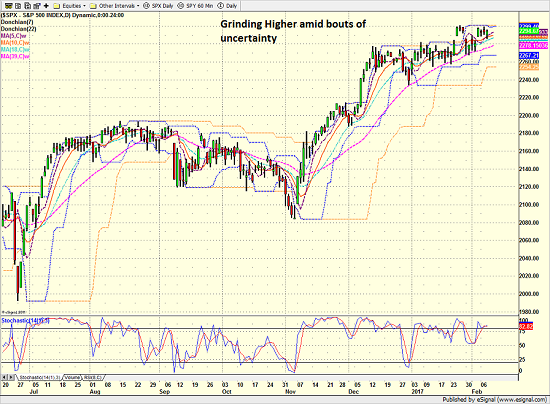 As such, this week's reading of 62.7 may give some investors reason for pause. Another bear argument is that investors have become overly complacent. The WSJ reports that we've now gone 85 consecutive days without the S&P experiencing a 1% decline on a daily basis. And the last time this occurred was in 2006. Super. So there you have it; a myriad of reasons to worry about the stock market. And doesn't this mean that the party will soon end and that investors should be proactively cautious? My response to the question posed above is, "not exactly." You see, just because a market is "set up" to for something doesn't mean the anticipated action will actually happen - especially in the time frame expected and when everyone is looking for the same thing. Remember, once the bull train starts to roll down the tracks, it usually takes something significant to slow it down. So, unless/until something comes out of the woodwork to spook investors in a meaningful way, the grind higher could easily continue - for a long period of time. I've seen this type of situation play out many, many times over the years. The bears tell us stocks can't go higher and yet they do. Hence the phrase, "the market can stay irrational longer than you can stay solvent." Lest we forget, the global QE game is still going as the ECB and the BOJ are both printing money at an impressive rate. And if there is anything we've learned since the QE era began, it is that an awful lot of the capital created by central bankers tends to wind up in the U.S. stock and bond markets. My feeling is that until the QE game ends across the pond, pullbacks and/or corrections in the U.S. stock market are likely to be short and shallow. And yes, unless a fundamental problem develops, this means that a "buy the dips" strategy remains appropriate for longer-term players. To be clear, this does NOT mean that we won't see a stiff correction in the stock market in the near future. But from a big-picture standpoint, it is important to keep your overall strategy in mind instead of succumbing to emotions when things start to get ugly.